Koso Kent Introl (KKI) has manufactured and supplied its first-ever titanium choke valve. The valve was specially designed for the redevelopment of the Yme oilfield, located 100km offshore on the Norwegian continental shelf. The Yme redevelopment comprises a Mobile Offshore Production Unit (MOPUstor) to extract crude oil, and a subsea storage tank. Stabilised crude is exported from here via a submerged loading system (SLS). The oil extraction method at Yme includes a sea water injection process, which replaces oil extracted from the field with sea water, making the remaining oil easier to recover. Salt water is extremely corrosive, so the valve installed on the sea water injection pipeline needed to be extremely hard wearing and corrosion resistant. Yme MOPUstor operator Talisman Energy Norge AS turned to leading severe service valve manufacturer KKI for a solution. KKI had manufactured control valves from titanium in the past, so for the Yme installation the company used this experience to develop its first choke valve with a titanium body and trim, and titanium nitride trim overlay. The valve is subjected to high pressures in the pipeline, so the trim specified is a two-stage HFL pressure let-down anti-cavitation device. HFL trims are used to eliminate cavitation and reduce noise by splitting the flow into many radial jets within the valve. Flow energy is dissipated and erosional forces are reduced, minimising erosion on the valve body and the downstream pipeline. The use of titanium gives the valve an extended lifetime in the harsh service conditions at Yme. 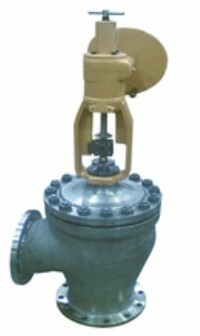 The valve was designed to meet NORSOK material requirements. It is a 10" (10"x10"x10") ANSI 150 valve with a body material of ASTM B367 GrC-2 (titanium). The valve was supplied and successfully fitted at the Yme MOPUstor installation early in 2009. David Johnson, Choke Valves Business Manager at KKI, says: "We are always delighted to rise to a challenge from our customers, and we are always developing and enhancing our valves and trims to meet the demands of increasingly severe service duties. Our first titanium choke valve for Yme is the latest milestone on this journey of continuous improvement." "We have more than 40 years� experience of supplying severe service valves and accessories. We use this expertise and knowledge to help customers overcome the challenges of high pressures, high temperatures and high pressure-drop ratios found in severe service applications in oil and gas, petrochemical and power installations worldwide."